The Cowichan Sweater is an iconic First Nation Clothing item with a fascinating history. Warm, water resistant, the Cowichan Sweater is an ideal garment for coastal BC and became a symbol for British Columbia. Canadian Prime Ministers, US Presidents, Hollywood stars, and members of the British Royal family have all been photographed wearing Cowichan sweaters. Traditional Coast Salish blankets have always held much importance in this coastal society. Blankets were a primary form of currency with a high value attached to them. As well as serving many practical functions, they held much spiritual significance. Weaving was a fundamental part of Coast Salish identity. Blankets made with a wool composed of mountain goat hair mixed with the hair of (now extinct) Salish Wool dogs took months or even years of work to produce. Their quality was the equal of Southwestern Navajo blankets and Northern Tlingit Chilkat blankets. During the 19th century, cheap mass produced trade blankets gradually replaced traditional blankets. Coast Salish women filled the void by taking up knitting needles, spinning machines and sheep’s wool. Adapting designs from their woven blankets and baskets, they knit warm sweaters, socks and toques for their families. Then began them trading with non-Native neighbours. Contemporary Cowichan sweaters are knit from natural, hand spun, undyed sheep’s wool. This strong and stretchy yarn makes a sweater that keeps its shape. The high lanolin content of the wool makes a water repellant, stain resistant sweater that keeps its wearer warm and dry, absorbs body moisture, and ventilates body heat. These sweaters, if taken care of should last for decades. They are passed down from generation to generation. Coast Salish women have created an industry. 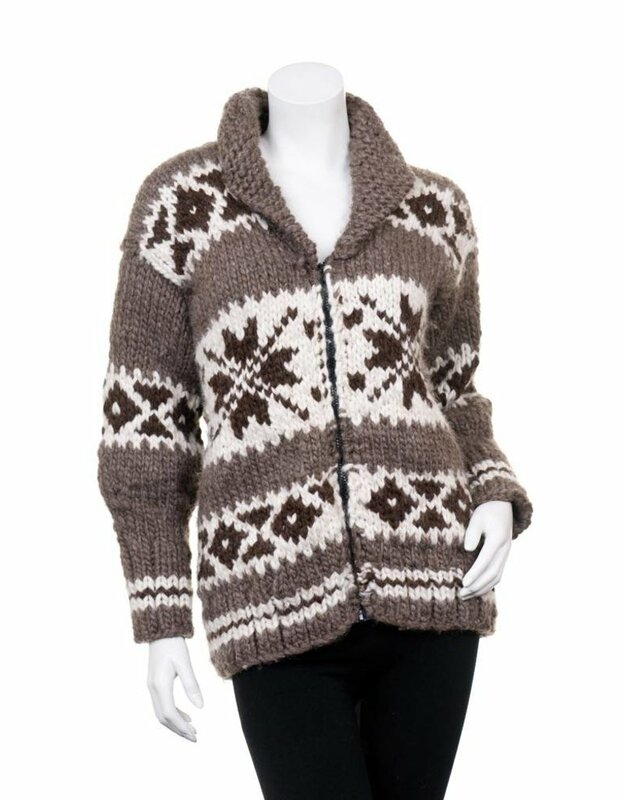 The modern Cowichan sweaters are marketed nationally and internationally. Knitting sweaters puts food on the table and gives the women the freedom to practice their culture by taking caring of their families and attending ceremonies. All of the Cowichan Sweaters at Cheryl's Trading Post are “Genuine Cowichan Sweaters” created by our relatives on the Cowichan reserve in Duncan B.C. Browse our selection of handmade and unique Cowichan Sweaters for sale in our online store.